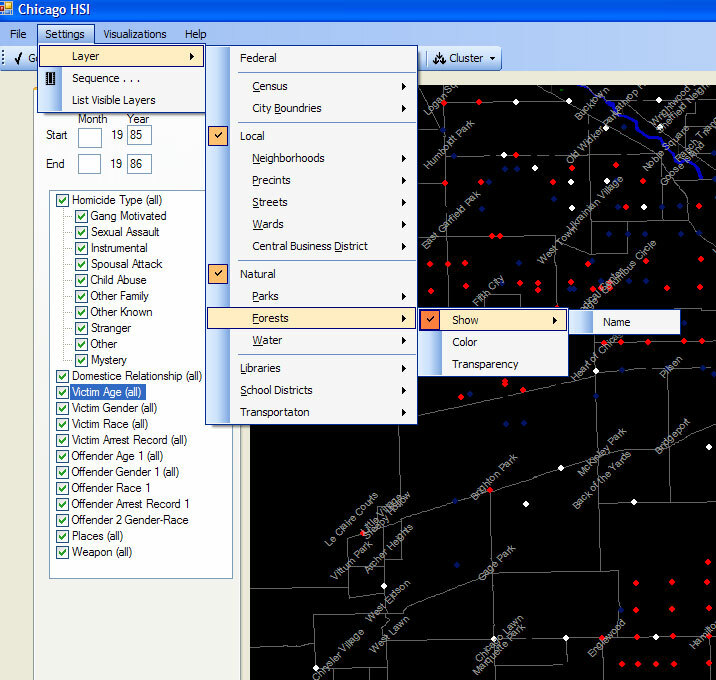 Chicago HSI is an application to research spatial relationships between homicide events in Chicago. This tool is comprised of multiple federal, state, and regional data resources organized into an intuitive visual display. 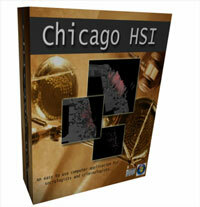 Chicago HSI was written by Lindsay Grace, using the Homicides in Chicago Data Set (ICPSR 6399). Please contact Lindsay Grace with any questions. Chicago HSI is an application to research spatial relationships between homicide events in Chicago. This tool is comprised of multiple federal, state, and regional data resources organized into an intuitive visual display. The program contains the history of homicides reported by the Chicago Police Department between 1965 and 1995. Users may analyze data through more than 13 demographic factors and view the data in historically accurate maps describing landmarks, boundaries, and census driven sociological factors. The program aggregates data from several disparate sources. The Chicago Homicide Dataset, The National Census Archive and the City of Chicago's GIS resource. More about the exact location of the data is provided in the application's references section. The homicide data is based on the publicly available Chicago Homicide Dataset (CHD). This archival version was manipulated to protect the identities of the individuals involved in these incidence. As a result it was necessary to derive location data by cross-reference geographic coordinates to census tracts. The visualizations produced are therefore only accurate within a block or two of the actual event. To provide accurate resolution, census level data is also provide at the census block level. Both panels may be moved for easier use. Events Tab:Contains a detailed report of each event in the selection range. The program also allow the user to create sequenced images of a selected time period to infer movement patterns of homicide activites.